McKee's 37 Hydro Blue Sio2 Coating, 32 oz. The 10 minute paint coating! Great Sio2 Costing 5 It doesn't very any easier than this. Spray a time or two per panel and immediately rinse off. It's literally that easy. Pros:Easiest ice ever used. Great hydrophobic properties. Hydro blue 5 Although I like a freshly detailed car I'm not a detailing guru or fanatic. I don't take the tires off, crawl underneath,etc. I would rather be driving. I have a black car and after I washed and applied hydro blue I was very satisfied. I hardly ever wash the car unless it rained I just maintain it with a quick detailer. I get a lot of compliments. Pros:Easy to use and does a great job. Cons:Pricey so I wait for sales and stock up.
? 5 Hydro blue is an amazingly simple product with great results! By far my most favorite product Ive ever used. Magic in a bottle 5 I could not believe how simple this made protecting my car. 10 minutes of work protected my car for 3 months. Cons:The sprayer on the bottle could be better, but the product itself is great. Hydro Blue is made for you 4 The results I got on my 2016 F-Type Jag in Rhodium Silver were outstanding! Shine is phenomenal. The results on a 2006 pearl white Suzuki Kizashi were also tops! The Kizashi looks better than new and it is 6 y/o. Too easy to apply. Nothing this easy should yield a result this good. It is no less than magic. Cons:Not sure, need more time with the product to see how long lasting it is. First use show really well after about 45 days. Hydro Blue 5 This product is amazing. Simple to use and it has amazing results. It makes protecting you car simple. The coating that it puts on your car is amazing. The paint looks wet when your finished and it dries so easy. Quick and easy to use 5 I love Hydro Blue. 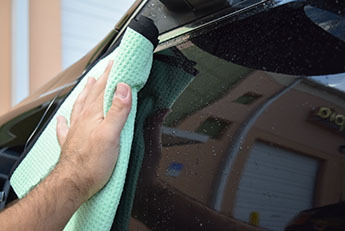 You wash your car, rinse, then spray one panel at a time and rinse it off quickly. Viola! A smooth and protected surface. 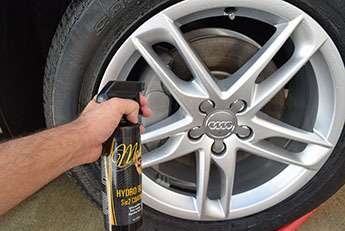 If you like to keep your car clean and looking good this is for you. One note: Make sure you rinse each panel immediately after spraying or you may experience some streaking. Cons:Follow directions carefully or you may experience streaking. hydro blue, I had my doubts? 5 amazing results, hard for me to believe it without seeing it but this stuff is amazing and I now use it around the house and outdoors on tools, etc. Pros:amazing water shedding ability and shine retention. Hydro Blue is awesome! 5 I love this stuff! I recently removed the wheels from the car and did a proper cleaning. I then sprayed them with Hydro Blue. This makes cleaning them later so much easier! I also use it on the car every few washes just to maintain protection. The shine is amazing! The car looks freshly waxed after a coat of Hydro Blue. I'll keep a gallon of this in hand at all times. Plus, I don't have to dilute it which makes it even better! Great..... 5 One of the best after wash products I have used in over 55 years of washing and detailing cars. Hydro Blue is a winner 5 Hydro Blue is top notch stuff. No streaks in full sun. Gloss like crazy and it's very simple to use. Great protection in 10 min! 5 Quick awesome protection! I use Hydro Blue as an occasional topper to reinforce the original coating applied to the paint. 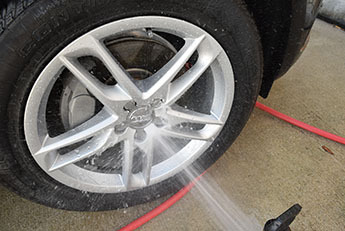 Great way to keep wheels looking great & easy to clean. 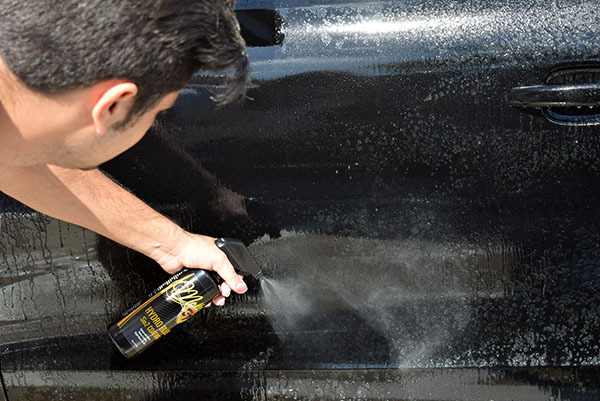 It's easy to apply too much, you only need a couple sprays per panel.